Mozilla thunderbird or any email client softwares didn’t have so effective spam filter for spam emails as the Gmail have. So its always a wise decision to use the Gmail Inbox for Self hosted Domain Email Account because its not just only safe but also allows you around 8GB email inbox. So here is the complete tutorial on How to Setup Gmail Inbox for Self hosted Domain Email Account. The comments are open below the post if you got something to say about the post. The very first step is goto Google Application, Enter your Domain name in the input box and Continue if you have already got your domain name. In case you don’t have any domain name, you can also buy it fro there which costs around $10. So I am using a domain name hackersthurst.com for the process. In the next step all you have to do is enter the administration detail along with other information as required the form and Continue. Choose the Email and password for the First administrator and the Sign up is done.
. Now Google Apps will redirect you to the Sign in page from where you will sign in to your Google Apps account with the first administrator details created above. 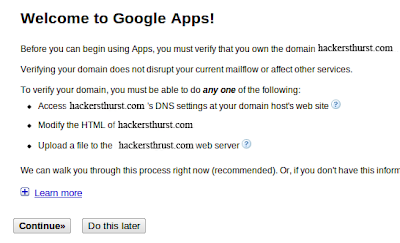 Google Apps will now ask you to verify that you are the Owner of that domain name. There are altogether four ways to verify your Domain, So you can chose any one method to verify. 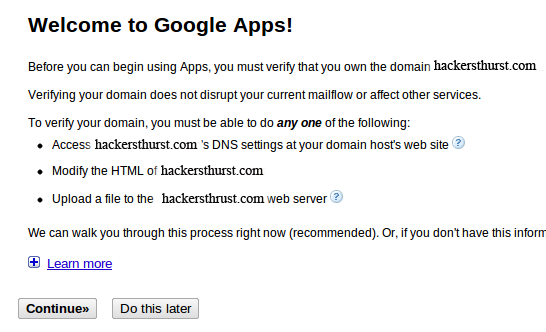 This is the most important step in the process to make Google apps confirm that the domain name belongs to you. To verify your domain name you can simply choose any one of the four methods provided. You can use any of the above steps to verify your domai name. If you want to verify by DNS record you must know your domain name provider. This may varies affording to your domain name provider. Verifying using the Meta tag can be also easier. As soon as you select the option “Add a meta tag to your site’s home page”, It will automatically show the Meta tag in the page. Copy the Meta tag and paste it into your site’s home page. It should go in the <head> section, before the first <body> section. If you are verifying by Uploading the HTML file, first download the HTML file and upload the downloaded HTML file into your root directory of your hosting account. As you select the “Upload an HTML file to your server” option in the lsit, It will instantly show the download Link of the file. 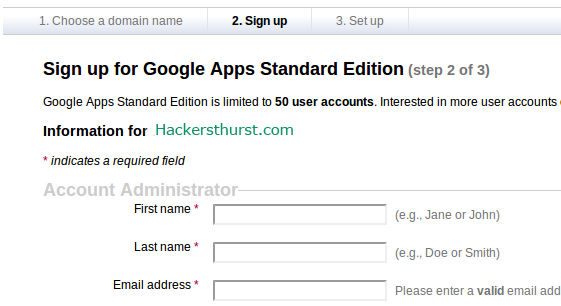 Verifying the domain name by Linking the Google apps to the Google Analytics account is a new method for verification. Google will find all Google Analytics tracking codes that are active on the index page for this site. Ownership of the site is established if you are an administrator for any of the Google Analytics website profiles found. You can use any one of the above methods to verify your domain name but choosing the easier and known one is better. After the verification is completed, You will be redirected to the Google Apps Dashboard where you will see various services along with the service status active and inactive. To activate Gmail Click on ‘Activate Email’ at the service setting section of the page. Now you have to change MX record from your webhosting account. Mx refers to mail exchanging exchange records. This process may differs from different hosting company. But you can find different hosting tutorial in the page.If your hosting company is not listed there you can simply follow any hosting company tutorial. After you are done activating, you can easily access your domain email aacount from Gmail. You can either loogin it directly from Gmail.com or from https://www.google.com/a/domain-name.